In natural seawater, potassium is a non-conservative major element with a concentration slightly lower than that of calcium (~399 ppm vs. ~413 ppm, respectively). It is a component of aragonite, and regular dosing has, within the past several years, been implicated in improving the blue coloration of numerous varieties of small-polyp stony corals; the benefits of potassium supplementation are potentially two-fold, then: provision of an element that is 1.) incorporated into the skeletal material of corals and other reef-buidling organisms for purposes of growth, and 2.) incorporated into pigments that (presumably in the presence of adequate ionic iron) enhance blue coloration of small-polyp stony corals. The importance of potassium to marine organisms is most apparent when beginning to dose it in aquaria with depleted potassium concentrations and/or in which the sea salt mixture used is potassium-deficient; in such cases, changes in the appearance of many corals may be observed within the first weeks of regular dosing. Maintaining potassium within a range of 390 - 410 ppm is sufficient for long-term health, growth, and coloration of corals when all other physical and chemical requirements are met. 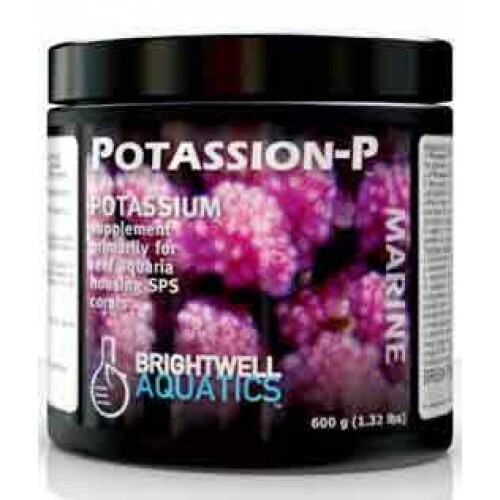 It is recommended that the potassium concentration in the aquarium be determined by using an accurate test kit prior to supplementing. Do not add this product directly to an aquarium containing live animals without first diluting in water as directed. Advanced: Create a stock solution by dissolving 5 grams (~2 teaspoons) of Potassion-P in 8-fl. oz. of fresh water (preferably purified); each ml of the solution will increase the potassium concentration (“[K+]”) in 1 US-gallon (3.785 L) of water by 1.7 ppm. [Reference: Each g of Potassion-P will increase the [K+] in 1 US-gallon (3.785 L) of water by ~129 ppm.] If initial [K+] in the aquarium is below 399 ppm, add stock sol’n at maximum rate of 10 ml per 20 US-gallons daily until desired concentration is attained, then dose daily or weekly as needed (see below). Maintain [K+] within a range of +/-10 ppm. Once desired [K+] has been acquired, measure aquarium's [K+] at the same time each day over a one- to two-week period to determine the daily rate of potassium uptake (i.e. the decrease in potassium). To determine daily dosing rate (preferable to weekly dosing): estimate volume of water in entire aquarium system (US-gal. ); divide the daily decrease in [K+] by 1.7; multiply this number by volume of water in system to obtain daily ml of stock sol’n required to maintain stable [K+].